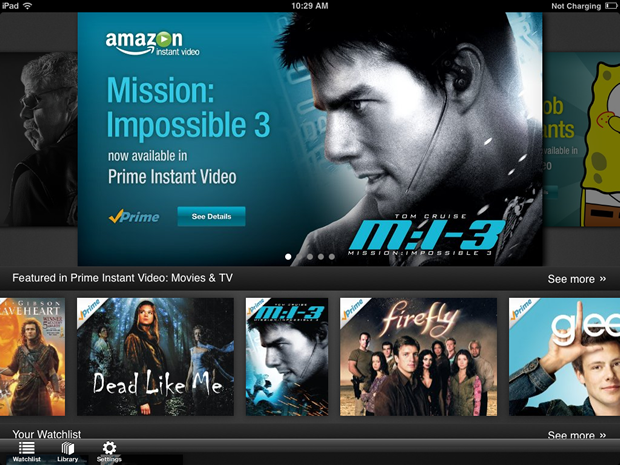 (CBS News) Amazon announced Wednesday the launch of the Amazon Instant Video App for the Apple iPad. The long-awaited app will let users stream or download movies and TV shows from their Amazon Prime libraries. Customers will also be able to watch videos purchased from Amazon Prime. The app is a day old, so there are some kinks that need to be worked out. According to The Verge, new video purchases have to be made on Amazon.com - instead of directly from the app. It also appears that the Amazon app is not compatible with Apple TV and AirPlay compatibility is limited to sound only, with video only available on the iPad. Amazon fans have not had a way to view their purchases on the iPad, until now - over two years after the launch of the original iPad. "If you are an Amazon Prime subscriber or otherwise rent or buy a lot of Amazon Instant Video, you'll have a one word reaction to this story: finally," wrote Cult of Mac deputy editor John Brownlee. The launch of the Amazon iPad app comes on the heels of theannouncement that Hulu Plus would finally be available on Apple TV, perhaps signalling a shift in Apple's strategy. "Hulu Plus, now this? Apple is loosening up," The Verge senior writer Tim Carmody tweeted. Whatever the reason, Amazon faithfuls have something to celebrate today. The Amazon app is available at the Apple App Store.